My record label hired the great Nick Mondello who did my recent interview in “All About Jazz” to write for their website on their jazz catalogue which is extensive. I can’t tell you how much it warms my heart to have a writer of this level write about my music. I have been reviewed by everyone but Nick is in another category and a really nice guy. His writing is like a great chorus. In Greek Mythology, the “Titans” were extremely powerful divine beings surpassed in their eminence only by the Gods themselves. 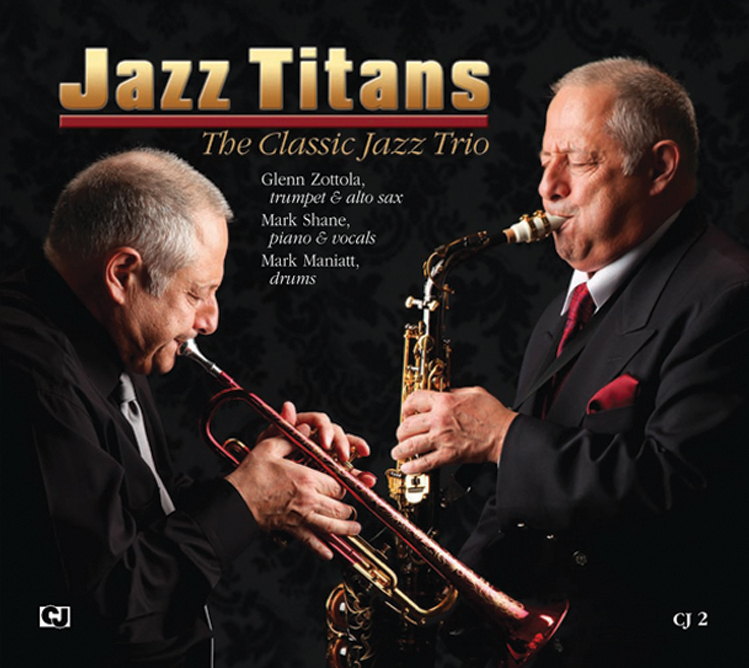 With this marvelously entertaining effort, multi-instrumentalist – and supremely talented – Glenn Zottola, superb pianist, Mark Shane and ever-so-tasteful drummer, Mark Manaitt – “The Classic Jazz Trio” – deliver a 16-selection mainstream jazz lightning bolt. Covering selections associated with artists on the Mt. Olympus of jazz – Louis Armstrong, Benny Goodman, Charlie Parker and others – Zottola and his bass-less brethren let it all fly in this hot session. A truly gifted musician of Herculean abilities, Zottola steps up brilliantly on both trumpet and saxophone – and nails both. That’s no easy task. His melodic and improvisational stylings on the trumpet are spectacular as he shades the great Louis Armstrong. One can easily tell that Zottola is an attentive student and “ear” of the Armstrong legacy. Blowing all-to-the-wall, he soars high and low (“Jubilee,” “I Can’t Believe that You’re in Love with Me,” “After You’ve Gone”). Simultaneously, his alto work channels both that other trumpet-sax genius, Benny Carter and Bebop great, Charlie Parker (“Yardbird Suite,” “Whispering”). Pianist Mark Shane is absolutely ideal in this wonderful Swing vein (“Whispers in the Dark,” “If I Had You”), displaying obvious salutes to Teddy Wilson, Earl “Fatha” Hines, et al. There’s elegance as well as heat here, too (“Polka Dots and Moonbeams”). Drummer Manaitt is shrewdly “there but not there” as he supports but never intrudes on the swingfest – and, festive it certainly is. While The Classic Jazz Trio is salutes “Jazz Titans,” with this heavenly recording the appellation certainly could also apply to its very mighty performers.